Set the stage for early reading success and numeracy skills with the Endless School Bundle! 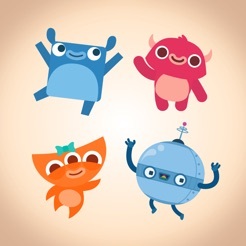 Kids will have a blast learning letters, words, numbers, and simple addition with the adorable Endless Monsters. - 75 words to learn and play with. - 341 sight words to learn and play with. - Numbers 1 through 100 to explore and learn. - Delightful animations reinforce number. recognition, quantity, and counting. - 30 spelling lessons (90 words). 60 more lessons (180 words) will be added as part of a free app update update later in 2015. - Lessons presented by Alphabot reinforce spelling and phonetic patterns in a fun and interactive way. Endless Alphabet, Endless Reader, Endless Numbers, and Endless Wordplay were designed with your children in mind. There are no high scores, failures, limits or stress. Your children can interact with the apps at their own pace. NOTE: Your device must be online for the apps to download the entire collection of words and numbers. My daughter is 22 months old and she love this apps. These are great apps. The letters have different shades and shapes so they’ll even work for colorblind kids. Sentences are different and characters are whimsical. This is truly one of the hidden gems in the App Store.